I’d like to begin by sharing an important statistic with you. This will provide you with some context as to why I invited our special guest on to speak with us. According to a report by the American Joint Replacement Registry, there were 860,000 hip and knee replacement surgeries in 2017. That means by the end of 2018, we will be over the one million mark in the United States. Thousands of these orthopedic surgeries are performed yearly within the Veterans Affairs. Patients are offered surgery as an option for pain relief and improved function. Did you know that chronic post-surgical pain is a common and debilitating problem that occurs in 5% to 85% of patients following surgery? Chronic post-surgical pain is highly correlated with prolonged opioid use. For example, the American Joint Replacement Registry found that 41% of patients who underwent a total knee replacement were still using opioids for their knee pain 90 days after surgery. That may be a recipe for addiction and harm for many patients. Veterans are particularly at high risk for developing chronic post-surgical pain due to their higher rates of post-traumatic stress disorder, anxiety and depression. 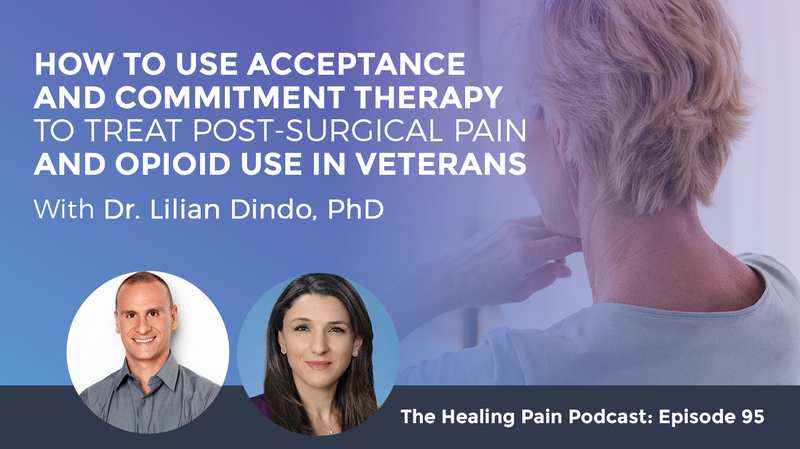 Here to discuss with us about how Acceptance and Commitment Therapy can be used to prevent chronic post-surgical pain and opioid use in at-risk veterans is Dr. Lilian Dindo. Dr. Dindo is a licensed Clinical Psychologist and Assistant Professor at the Baylor College of Medicine and a research health scientist at the Center for Innovations at the Michael E. DeBakey VA Medical Center in Houston, Texas. Dr. Dindo’s research interests are in developing innovative and pragmatic psychotherapeutic interventions aimed at improving the mental health and functioning of patients with chronic health problems with a particular focus on Acceptance and Commitment Therapy. 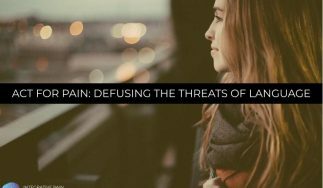 In this episode you will learn why chronic post-surgical pain develops, who’s at risk for developing chronic post-surgical pain? Why veterans have an increased risk? How we can intervene early and prevent this pain? How a one day intervention using ACT shows great promise in preventing chronic post-surgical pain? To help you learn about ACT or Acceptance and Commitment Therapy, I have prepared a great freebie to support you. It’s called the ACT Starter Kit. All you have to do to download it is go to www.DrJoeTatta.com/95Download. You can also text the word 95Download to the number 44222. Lilian, welcome to the podcast. It’s great to have you here. Joe, I’m excited to be here. Thanks for having me. I’m excited to talk about this topic. As I was preparing for this, I was looking back at almost 100 podcasts on things related to pain, but very few of them have been about prevention. You have recently explored something that’s going to be important in the future. It’s around the prevention of pain. You’ve explored it in a population of people that need help and support, which are in veterans. Tell our readers a little bit about yourself, what you’re about and how you got involved in exploring this topic. I’m a clinical psychologist and I currently work at the Baylor College of Medicine and also at the Houston Veterans Affairs Medical Center. I’m part of a research center that integrates research with both veteran and non-veteran populations. I’ve always been interested in behavioral medicine from a research perspective and my clinical passion in graduate school was quickly ACT. I fell in love with ACT and believed in it, believed in the scientific research of it. I did a postdoc after I finished graduate school and the key was to examine the efficacy of this clinical trial in patients with postpartum depression. What became clear quickly to me, is that it was hard to bring patients in week after week. I started reading a little bit more about this. Is this an issue with patients with postpartum? The answer is no. Treatment adherence and compliance is a big problem. These gold standard clinical trials where people go in for twelve to fifteen sessions are what happen in the community, it isn’t what happens on the ground. I became interested right away in figuring out how to make ACT brief and effective. I looked into Kirk Strosahl’s work, who does all this work in ACT and primary care. His big thing is you can get changed quickly with ACT, you need to get them to walk through the door. He talks about them walking through the door. I examined the literature and I saw that the mean number of sessions that people go to is four. The modal number of sessions that people go to is one. If the modal number of sessions is one and the mean is four, “I’ll bring them in once and I’ll give them more than four hours.” They’ll get more than what they would usually get in the community. That was why I delved into developing a one-day program. I was interested in making it something that can be deployed into clinical or community settings. The other thing that became clear to me is that stigma is such a problem. We think we’ve addressed the problem of stigma in mental health, but we haven’t, particularly in patients with medical conditions. I was looking at the literature and depression and anxiety are problems in all chronic medical conditions. They exacerbate every chronic medical conditions and the effect is bidirectional. I did want to address the issue of depression, anxiety and medical conditions. I also recognize that when patients come in to address a medical condition, they’re not interested in dealing with their depression or anxiety. They want their medical condition addressed and they don’t want that minimized. I thought, “A one-day ACT workshop, it’s not as threatening. It’s not as stigmatizing as therapy.” A lot of primary care, specialty care, and chronic pain centers, they do multimodal interventions or educational interventions. If you fit in this therapeutic intervention into an educational one, it’s more likely to be disseminated. That’s a long answer to your question. It addresses my interest is brief interventions to make them more deployable into the community, brief and non-stigmatizing interventions. I’ve always been interested in the role of depression and anxiety in any chronic medical conditions, one of them is pain, one of them is surgery and one of them is migraine pain and how we can use therapy to help that. Brief and non-stigmatizing interventions are more deployable into the community. All great and important points for those who are practitioners, or if you’re someone with chronic pain, you’re reading this blog. The point of someone going to, let’s say psychotherapy twice a week for eight weeks. 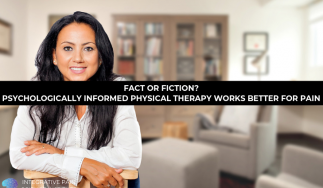 You mentioned the average amount of time they may go is four visits, which echoes across all of the “therapies”, whether it’s physical therapy, occupational therapy and nutritional therapy. When we sit back and if we think about it, we’re asking people with chronic pain to do a lot by coming in twice a week for eight weeks. Sometimes I’ve even seen sixteen-week protocols and I say to myself, “Sixteen weeks is a long time to ask someone to be compliant, to carve the time out of their week, to open up their checkbook.” Oftentimes, health insurance doesn’t cover a lot of these therapies, both psychotherapy and physical therapy for long periods of time. The idea of a brief intervention that someone can do once that has long standing effects is important. The study you completed is called Acceptance and Commitment Therapy for Prevention of Chronic Post-Surgical Pain and Opioid Use in At-Risk Veterans: A Pilot Randomized Controlled Study. It was published in the 2018 edition of The Journal of Pain. Tell us what the purpose of this study was. Acceptance and commitment therapy is an empirically-supported treatment for chronic pain. One of the issues that have been under recognized in the chronic pain literature is that often chronic pain starts somewhere. Some reviews and some meta-analysis have found that approximately 20% of chronic pain patients start off with some surgery. There’s a lot of variability in terms of which surgeries put people at higher risk for chronic pain. The range is from about 10% to 80%. Some surgeries are high risk for developing chronic pain and some less so. The focus in our medical community has generally been on treating chronic pain. The struggle for me has been why are we waiting until it gets chronic for us to treat it? Why are we not helping people pre-surgery to address the issue of pain? Give them coping strategies for how to deal with pain, so we don’t have to have that transition from acute pain to chronic pain. As soon as you start to look at the literature on surgeries and the development of chronic pain in surgeries, you quickly see there’s a large literature of the risk factors that put patients at-risk for chronic post-surgical pain. They’re pretty consistent across different surgeries, depression, anxiety, general high, negative emotions, pain catastrophizing are all things that put patients at higher risk for developing chronic post-surgical pain. In fact, people who have these risk factors are about two times more likely to develop chronic pain than those who don’t have those risk factors. These are modifiable risk factors. We know we can modify depression, we know we can modify anxiety. Why are we not doing it? Why are we not helping people before they develop chronic pain? Unfortunately, chronic pain is strongly linked to the opioid epidemic. You’ve got this negative cycle that happens if a person develops chronic pain. I became interested in moving up to the before the acute phase even, in helping people address these modifiable risk factors. That’s another thing that’s interesting about risk factors. We know that, for example, optimism, pre-surgery, positive expectation, that’s a protective factor. It’s the opposite. Forget about therapy, just educating patients about what to expect. How to take their medications? What to do in terms of rehab? That in itself can be protective post-surgery. It’s amazing that we don’t take these basic precautions. One of the things that’s been striking about the work that we did was when we did this actual workshop with these veterans, we told them to expect pain. Some amount of pain is normative, and some basic information about the normal timeframe of pain also the negative effects of opioids in terms of pain sensitization. People were surprised. I was surprised that people were surprised at that basic information. That some level of pain is normal and it’s how you respond to that pain. A lot of people also feel they should avoid activity at all costs if there’s even a slight amount of pain. That’s the complete opposite of what’s expected. It’s expected that people start to get active and engaged. We are doing our patients a disservice by not even providing them that basic level of information. As a physical therapist, I would echo that. It always was curious to me how there were certain conditions, namely knee and hip replacements, that we mobilize patients day one as fast as possible. It doesn’t matter whether they’re still hung over from their drugs, whether their knee is swollen, whether they have a DVT. We have them up and out of bed, they’re exercising. A lot of ways we’re exposing them to pain which probably in some ways is decreasing their response to it. They’re starting to open up to some of these sensations versus we have other diagnoses like chronic low back pain, fibromyalgia. Oftentimes, the message that comes from practitioners is, “Don’t do anything that causes you pain. Don’t move.” We know that that’s not the right message and we’re causing harm by sending that message. Your paper and all the other podcasts we’ve done, it’s incredible because I’ve had patients email me and say, “I listened to a couple of your podcasts and my pain is better from listening to it,” which is ironic because we know that education and giving some people some bit of empowerment information that they can use where they realize,“ This is what’s going on instead of what I thought was happening, that no one ever explained to me,” it can be pivotal. In this one-day workshop, first tell us how many hours it was? If you can tell us some of the ingredients in that workshop, it’d be beneficial for other practitioners to hear about. The workshop is about six hours with lunches and breaks. We usually start it about 10:00 AM. Have lunch at around 12:30 PM. We end at about 4 PM. In the workshop, we always start with values. What’s important to you? We start with being pretty broad. Introduce yourself and one thing that’s important to you. We are trying to create the setting and the context within which all this work happens. At the end of the day, why would someone be interested or willing to experience pain or to do the hard work of rehab? Having the values to honor that is valuable. An important piece of ACT is this creative hopelessness piece in ACT, keeping in mind that we have people who are depressed or anxious, people who are at high risk for developing chronic pain. It’s important to acknowledge that to patients that these strategies we use to decrease internal pain, whether it’s physical or emotional pain, they work well. That’s why all use them as human beings. There’s this common link as human beings that we all like to avoid pain. We say, “They work well. How does it work in the long run?” In a second, everyone acknowledges, “It doesn’t work well in the long-run.” “What about the cost? Is there a cost to doing this over and over again?” There’s a cost to using opioids long-term. There’s a cost to using alcohol long-term. There’s a cost to disengaging from the world long-term. There’s something powerful. Even though patients know this, no one’s explicitly laid it out this way for them. We all use these avoidance strategies because they work. We’re suckers for short-term relief. The problem is that in the long-term they don’t work well. ACT is transdiagnostic. We’re not just addressing the pain in this workshop. We’re also addressing the depression, the anxiety, even the catastrophizing. Once we’ve established that in the workshop, we say, “What’s the alternative to running away or avoiding?” The alternative is mindfulness, it’s acceptance and it’s engaging in life even when it might be hard because it’s important. I don’t know if you know these experimental exercises where they ask patients to put their hand in buckets of ice. If you tell patients, if you give them instructions to distract when they put their hands in buckets of ice versus instructions to be mindful of the feelings of the ice, do you know which ones stay longer? The ones that is mindful. Yes, people who are mindful of pain can experience pain far longer, especially if they’re thinking about, “This is worth it for a reason.” The values piece as well. If you combine the mindfulness piece with the values piece, you’ve got an amazing amount of pain that you can experience. We share that. We’ve used that exercise. We do a lot of mindfulness exercises, but the thing that I’ve also learned in this one-day workshop is you have to give them concrete exercises. We’ve done diaphragmatic breathing in the workshop. In the post-interview follow-ups, we’ve heard that they liked that. They like these brief exercises that they can hang onto. These diaphragmatic breathing when they feel they’re starting to get overwhelmed or even connecting to your five senses. I tell them, “When you’re starting to feel you’re overwhelmed in your head with your pain, any internal sensations, how do you get out of your head for a moment?” Focus on your five senses and I do it in the session. What are the two things that you’re seeing right now? What are the two things you’re hearing? What are the two things you can taste in your mouth or smell? I say, “In the last twenty seconds, where were you?” They can all recognize that for those twenty seconds they were outside of themselves. They were in the world for even that brief time. We talk a lot about how illness makes us narrow. Narrow in on the illness or the pain. We lose sight of other things. We’ve forgotten about our friends, our family and other roles in our lives. We start to define ourselves by our illnesses or internal experiences. How do we start to step back and experience these things more fully again? We use something called the ACT Matrix as a framework, where we’re constantly asking people, “What can you do that moves you toward something that matters? What are things you do to run away from feeling uncomfortable or pain? What are the things that you are afraid of that that you do want to run away from? What are these hooks for you?” We spend a lot of time doing exercises to get them to experience the exercises or to experience these things. The first part, the creative hopelessness part, which if someone’s not familiar with ACT, they probably don’t quite know what that means. If you’re someone with chronic pain, you may have never been exposed to this. If we role play a little bit, Lilian, I’ll be the therapist and you can be the patient. If you said to someone, “Did taking an opioid help you in the short-term?” They would say? How has taken an opioid affected you in the long-term? It’s better for the hours afterwards, but then I need to take it again. When you have pain, you go into your bedroom and you sleep the pain away. How has that worked for you short-term? If we broaden our focus and take a 30,000-foot view over when you have pain, you go to bed for longer periods of time and sleep, how has that affected your pain and how has it affected your life? As you take a patient through each of these interventions, as you know as well as I do, those who have chronic pain probably have a list of ten of these quick fixes. What opens up in them when that happens? I’ve noticed this a-ha moment. This hasn’t worked at all. I’m in this vicious cycle and there might be an alternative. There’s this moment of hope that there might be an alternative. That I’m in this cycle, I need to get out of the cycle. I’ve found that the creative hopelessness piece that you described nicely to be key to move to the next part. Once they get it, there’s this a-ha moment. If the therapist doesn’t do it in a critical way, it can’t be critical like, “You’ve been doing this and it’s ridiculous. See, it doesn’t work.” I try to make it clear like I do it. Who doesn’t want short-term relief? We all want short-term relief. Validating that we’ve gotten stuck on this, because of how good it feels. It feels like it’s working in the short-term. No one has encouraged us to step back and ask like, “What about the long-term? Is it solving the problem in the long-term? Is there a huge cost of some sort?” There’s this freedom in the moment of recognizing like, “I know why I’ve been doing it. I’m not a loser. I’m doing it,” and there’s an alternative. There is a way out. It’s a lifting of a weight off of a patient’s shoulders where they recognize, “Someone realizes all the things I’ve been through. I’m recognizing that what I’ve been doing hasn’t worked. I’m willing to open up and try something different, a different perspective or a different view.” What we teach people in our society now. We teach people that there are quick fixes for pain and there are these quick interventions that help people and oftentimes, they don’t. As you were doing some research for this project, did you come across other ACT interventions that were used for chronic post-surgical pain and opioid use? I haven’t heard that much about ACT being used for let’s say, opioid overuse or coming off opioids, as well as the chronic post-surgical pain. I have not seen it, except for the Toronto General Hospital. There’s a surgical unit and it’s not research, but it’s a surgical unit where they have a multidisciplinary team. Everyone who gets surgery gets ACT. It’s an ACT-trained therapist that’s on the unit. They’re the only team that I’m familiar with that’s moved into the surgical area, the ACT for post-surgical pain. They have a few papers, they’re not randomized clinical trials but more like effectiveness work within the hospital. Where they found that doing these brief ACT interventions at the bedside, in addition to the education that they usually get, leads to lower levels of opioid use and better pain control. Since you work and have relationship with the VA, I want to read a quote from your paper that says, “Thousands of orthopedic surgeries are performed yearly within the Veterans Affairs health care system. In this population, the stress-based conditions including post-traumatic stress disorder, anxiety and depression are common for those who have experienced the atrocities or massacres during deployment. The veterans are at high risk for developing chronic post-surgical pain and/or the patients targeted in this present study.” It’s such an important population, the veterans, how we take care of them. What are the reverberations of this paper within the VA that you’ve experienced? The thoughts and opinions of others that have read your paper within the VA, knowing that you had some good results even though it’s a pilot study. Doing brief ACT interventions at the bedside, in addition to the education that they usually get, leads to lower levels of opioid use and better pain control. The surgeons don’t know about these psychological factors that might be influencing. They feel that there’s something that’s psychologically, potentially influencing the outcome and they say, “Please, do anything here for us to help us out.” They love the idea of a one-day workshop. 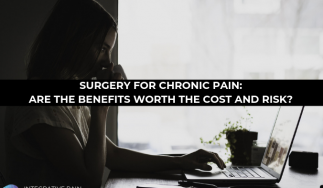 It is burdensome to come to the hospital once a week, twice a week, especially if you’re, for example, having difficulty with your knee, your hip or any of the other high-risk surgeries. You’re not going to be going to the hospital once or twice a week in addition to all your other appointments. Doing a one -day workshop, you have this one point before the surgery where you give people an intervention. It can be part of what they already provide in rehabilitation or in their educational classes. We’ve gotten a lot of support for this from our surgeons. When we got our score and our grant, it was on the edge and the surgeons were, “You need to do this.” We’ve been getting support on this. I did a podcast, it was podcast number 83, where a graduate student of psychology combined ACT physical therapy and had good results. It was a pilot study, more research needs to be done. We have a number of these things starting to pile up. It’s helping obviously inform the psychologist practice. We’re going to see and inform everyone who has a contact with a patient that’s in pain throughout their life cycle, which would be incredible and amazing. People are going to want to know and learn more about you. Where can they reach out to you and find you? They can certainly email me at Lilian.Dindo@BCM.edu. That’s probably the best way to reach me. I’m pretty good at responding to emails and I’m happy to respond to email. Check out her study called Acceptance and Commitment Therapy for Prevention of Chronic Postsurgical Pain and Opioid Use in At-Risk Veterans which was published in the 2018 edition of The Journal of Pain. I want to thank Lilian for being on the Healing Pain Podcast. It’s been a pleasure. Make sure to share this podcast with your friends and family on your favorite social media handle. Sign up for the podcast at DrJoeTatta.com/Podcast so I can send you the latest podcast each week in your inbox. We’ll see you next time. Thank you. Thank you so much. This was fun. I love your work. The focus of Dr. Dindo’s career has been on developing pragmatic and innovative ways to improve the mental health and functioning of patients suffering from psychiatric and chronic medical conditions. A significant obstacle to effective delivery of mental health services is treatment adherence and dropout. Additionally, depression and anxiety are often under-reported and undertreated in medical settings. Applying a 1-day (5-hour) transdiagnostic Acceptance and Commitment Training, presented as a “workshop”, is less stigmatizing than “therapy” and also ensures treatment adherence and completion. Dr. Dindo has been involved in several clinical trials examining the efficacy of a 1-day ACT treatment on the mental health, functioning, and quality of life of Veterans and Civilians with who have chronic medical conditions and are experiencing significant distress. Among the populations studied are: 1) Veterans with pain, mild traumatic brain injury, and distress; 2) Veterans undergoing orthopedic surgery and are at-risk for developing chronic pain; 3) patients (Veteran and non-Veteran) with migraine pain and depression; and 4) Veterans with inflammatory bowel disease and significant distress. In addition to developing 1-day interventions, she also examines the use of electronic technology to assess various psychiatric measures and to deliver treatments.